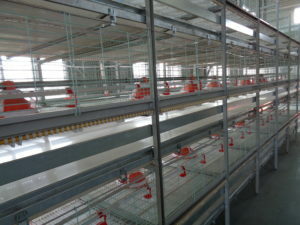 Broiler chicken battery cages is an essential part of modern industrial poultry rearing on chicken farm. The price of battery broiler chicken cage mainly depends on the cost of production and a piece of broiler poultry equipment, therefore poultry manufacturers have to be more wise about the selection of farming case and strategies. Broiler Cages of Livi Machinery for chicken poultry rearing are specialized for high density and large scale rearing of broiler chickens. The basic structure of the cage is almost identical to the layer cage, but the only difference is we can adopt the farming mode of feeding grounds for broilers. Overall less cost in battery broiler cage system. The per unit area density of rearing broilers increase 50%-100% compared with flooring rearing system. Flocks birds are kept away from manure in broiler battery cage, enormously help improve the Overall performance for broiler health. Main components of the broiler cage system are consisting of hot-dip galvanized sheet and wire material, which is elected for the metal body to avoid corrosion or rust on the cages of chicken farm. To lessen the loss of feed wastage, the design of broiler cage is modified that the feed lost comes to a minimum level. Zhengzhou Livi Machinery Manufacturing Co.,Ltd is an expert on the broiler cages. Quality and service is our final objects all the time. We hope to be your commercial friends as well as a best relationships with you.